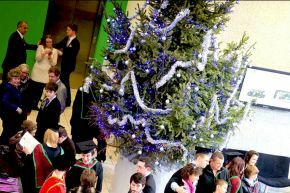 Ulster University Provosts will be hosting Christmas receptions for staff, students, alumni and friends across each of our four campuses over the coming weeks. We would be delighted if you were free to join us to celebrate the Christmas period. You can RSVP by choosing the most appropriate event/s below. Join us for our special 50 Years Christmas celebration event, hosted by Professor Karise Hutchinson, Provost of the Coleraine campus. Celebrations will begin with Christmas carols by our University staff choir, followed by a talk through the decades by Professor Alan Sharp (former Provost of Coleraine campus) and Ken Ward (first member of staff to join the institution on the Coleraine campus). There will also be an opportunity to view memorabilia from across five decades as part of our 50 Years exhibition as part of our 50 Years exhibition. Join us for our Christmas celebrations, hosted by Dr Malachy Ó Néill, Provost of the Magee campus, which will include carol singing and hot chocolate around the Christmas tree. Join us for our Christmas Reception, hosted by Professor Raffaella Folli, Provost of the Jordanstown/Belfast campus, which will feature a performance by Ulster University student Emily-Rose Conlon, Musician and Singer-Songwriter. Join us for our Christmas Reception, hosted by Professor Raffaella Folli, Provost of the Jordanstown/Belfast campus, which will feature a performance by St Malachy's College, Belfast Trad Band. Please register to reserve your place indicating clearly which location you wish to attend as festive refreshments will be served. Feel free to share with any Ulster University graduates you know.